Two Filipino citizens get validly married. One spouse later becomes a foreign citizen. This spouse then obtains a valid divorce decree. The divorce decree allows this spouse to remarry. Can the other spouse (who is still a Filipino citizen) likewise remarry under Philippine law? Yes, according to the Supreme Court ruling in the case of Republic of the Philippines v. Cipriano Orbecido III, G.R. No. 154380, promulgated on October 5, 2005. Ponente of the decision was Justice Leonardo A. Quisumbing. All marriages solemnized outside the Philippines in accordance with the laws in force in the country where they were solemnized, and valid there as such, shall also be valid in this country, except those prohibited under Articles 35(1), (4), (5) and (6), 36, 37 and 38. Where a marriage between a Filipino citizen and a foreigner is validly celebrated and a divorce is thereafter validly obtained abroad by the alien spouse capacitating him or her to remarry, the Filipino spouse shall have capacity to remarry under Philippine law. Does Article 26 apply only to a mixed marriage, that is, between a Filipino and a foreigner? 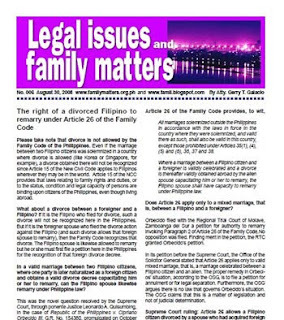 In its petition before the Supreme Court, the Office of the Solicitor General stated that Article 26 applies only to valid mixed marriage, that is, a marriage celebrated between a Filipino citizen and an alien. The proper remedy in Orbecido’s situation, according to the OSG, is to file a petition for annulment or for legal separation. Furthermore, the OSG argues there is no law that governs Orbecido’s situation. The OSG claims that this is a matter of legislation and not of judicial determination. 1. Taking into consideration the legislative intent and applying the rule of reason, we hold that Paragraph 2 of Article 26 should be interpreted to include cases involving parties who, at the time of the celebration of the marriage were Filipino citizens, but later on, one of them becomes naturalized as a foreign citizen and obtains a divorce decree. The Filipino spouse should likewise be allowed to remarry as if the other party were a foreigner at the time of the solemnization of the marriage. To rule otherwise would be to sanction absurdity and injustice. Where the interpretation of a statute according to its exact and literal import would lead to mischievous results or contravene the clear purpose of the legislature, it should be construed according to its spirit and reason, disregarding as far as necessary the letter of the law. A statute may therefore be extended to cases not within the literal meaning of its terms, so long as they come within its spirit or intent. 2. 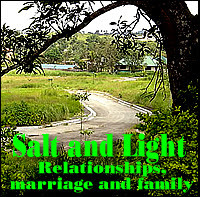 If we are to give meaning to the legislative intent to avoid the absurd situation where the Filipino spouse remains married to the alien spouse who, after obtaining a divorce is no longer married to the Filipino spouse, then the instant case must be deemed as coming within the contemplation of Paragraph 2 of Article 26. A valid divorce is obtained abroad by the alien spouse capacitating him or her to remarry. 4. The reckoning point is not the citizenship of the parties at the time of the celebration of the marriage, but their citizenship at the time a valid divorce is obtained abroad by the alien spouse capacitating the latter to remarry. In this case, when Cipriano’s wife was naturalized as an American citizen, there was still a valid marriage that has been celebrated between her and Cipriano. As fate would have it, the naturalized alien wife subsequently obtained a valid divorce capacitating her to remarry. Clearly, the twin requisites for the application of Paragraph 2 of Article 26 are both present in this case. Thus Cipriano, the “divorced” Filipino spouse, should be allowed to remarry. We are also unable to sustain the OSG’s theory that the proper remedy of the Filipino spouse is to file either a petition for annulment or a petition for legal separation. Annulment would be a long and tedious process, and in this particular case, not even feasible, considering that the marriage of the parties appears to have all the badges of validity. On the other hand, legal separation would not be a sufficient remedy for it would not sever the marriage tie; hence, the legally separated Filipino spouse would still remain married to the naturalized alien spouse. On May 24, 1981, Cipriano Orbecido III married Lady Myros M. Villanueva at the United Church of Christ in the Philippines in Lam-an, Ozamis City. Their marriage was blessed with a son and a daughter, Kristoffer Simbortriz V. Orbecido and Lady Kimberly V. Orbecido. 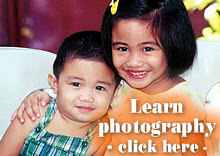 In 1986, Cipriano’s wife left for the United States bringing along their son Kristoffer. A few years later, Cipriano discovered that his wife had been naturalized as an American citizen. Sometime in 2000, Cipriano learned from his son that his wife had obtained a divorce decree and then married a certain Innocent Stanley. She, Stanley and her child by him currently live at 5566 A. Walnut Grove Avenue, San Gabriel, California. Cipriano thereafter filed with the trial court a petition for authority to remarry invoking Paragraph 2 of Article 26 of the Family Code. No opposition was filed. Finding merit in the petition, the court granted the same. The Republic, herein petitioner, through the Office of the Solicitor General (OSG), sought reconsideration but it was denied. In its petition before the Supreme Court, the OSG raised a pure question of law: Whether or not respondent can remarry under Article 26 of the Family Code. The records are bereft of competent evidence duly submitted by respondent concerning the divorce decree and the naturalization of respondent’s wife. It is settled rule that one who alleges a fact has the burden of proving it and mere allegation is not evidence. Accordingly, for his plea to prosper, respondent herein must prove his allegation that his wife was naturalized as an American citizen. Likewise, before a foreign divorce decree can be recognized by our own courts, the party pleading it must prove the divorce as a fact and demonstrate its conformity to the foreign law allowing it. Such foreign law must also be proved as our courts cannot take judicial notice of foreign laws. Like any other fact, such laws must be alleged and proved. Furthermore, respondent must also show that the divorce decree allows his former wife to remarry as specifically required in Article 26. Otherwise, there would be no evidence sufficient to declare that he is capacitated to enter into another marriage. Note: This portion of the Court’s decision does not contradict its ruling that a Filipino divorced by a former Filipino citizen can remarry under Article 26, 2nd paragraph. It simply states that Orbecido did not submit the proper evidence before the Regional Trial Court of Molave, Zamboanga del Sur to prove his claims (that his wife became a naturalized US citizen and had later on gotten a divorce, etc). Orbecido could re-file the case, this time submitting the proper evidence, or ask for a re-opening of the proceedings before the RTC.